Christianity was persecuted by Roman imperial authorities early on in its history within the greater empire. By the early part of the second century Christians are no longer viewed as part of a Jewish sect, but are considered as belonging to one of many foreign cults that infiltrated the Empire. They gradually become conspicuous by their absence from festival activities where ritual sacrifices for the health of the emperor and well-being of the empire take place, behavior that carried a "whiff of both sacrilege and treason." The first documented case of imperially-supervised persecution of the Christians in the Roman Empire begins with Nero (37–68). In 64 AD, a great fire broke out in Rome, destroying portions of the city and economically devastating the Roman population. Nero himself was suspected as the arsonist by Suetonius. In his Annals, Tacitus (who claimed Nero was in Antium at the time of the fire's outbreak), stated that "to get rid of the report, Nero fastened the guilt and inflicted the most exquisite tortures on a class hated for their abominations, called Christians [or Chrestians by the populace" (Tacit. Annals XV, see Tacitus on Jesus). Suetonius, later to the period, does not mention any persecution after the fire, but in a previous paragraph unrelated to the fire, mentions punishments inflicted on Christians, defined as men following a new and malefic superstition. Suetonius however does not specify the reasons for the punishment, he just listed the fact together with other abuses put down by Nero. By the mid-2nd century, mobs could be found willing to throw stones at Christians, and they might be mobilized by rival sects. The Persecution in Lyon was preceded by mob violence, including assaults, robberies and stonings (Eusebius, Ecclesiastical History 5.1.7). Further state persecutions were desultory until the 3rd century, though Tertullian's Apologeticus of 197 was ostensibly written in defense of persecuted Christians and addressed to Roman governors. There was no empire-wide persecution of Christians until the reign of Decius in the third century. A decree was issued requiring public sacrifice, a formality equivalent to a testimonial of allegiance to the Emperor and the established order. Christians who refused were charged with impiety and punished by arrest, imprisonment, torture, and/or executions. Some Christians and purchased their certificates, called libelli, which certified their compliance; others fled to safe havens in the countryside. Several councils held at Carthage debated the extent to which the community should accept lapsed Christians. The persecutions culminated with Diocletian and Galerius at the end of the third and beginning of the 4th century. Beginning with a series of four edicts banning Christian practices and ordering the imprisonment of Christian clergy, the persecution intensified until all Christians in the empire were commanded to sacrifice to the gods or face immediate execution. This persecution lasted until Constantine I, along with Licinius, legalized Christianity in 313. It was not until Theodosius I in the later 4th century that Christianity would become the State church of the Roman Empire. Between these two events Julian II temporarily restored the traditional Roman religion and established broad religious tolerance renewing Pagan and Christian hostilities. In the 300 years from the crucifixion of Christ to the conversion of Emperor Constantine, polytheistic Roman emperors initiated no more than four general persecutions of Christians. Local administrators and governors incited some anti-Christian violence of their own. Still, if we combine all the victims of all these persecutions, it turns out that in these three centuries, the polytheistic Romans killed no more than a few thousand Christians." The Edict of Milan of 313 finally legalized Christianity, with it gaining governmental privileges and a degree of official approval under Constantine, who granted privileges such as tax exemptions to Christian clergy. In the period of 313 to 391, both paganism and Christianity were legal religions, with their respective adherents vying for power in the Roman Empire. This period of transition is also known as the Constantinian shift. For the first two centuries of the Byzantine Empire, official policy towards paganism was cautious and tolerant. In 380, Theodosius I made Nicene Christianity the state church of the Roman Empire. Paganism was tolerated for another 12 years, until 392, when Theodosius passed legislation prohibiting all pagan worship. Pagan religions from this point were increasingly persecuted, a process which lasted throughout the 5th century. Hover, even with the closing of the Neoplatonic Academy by decree of Justinian I in 529, its philosophers were permitted to remain within the Empire without converting to Christianity, although many of its scholars choose to move to the more tolerant Sassanid Persia. Lay Christians took advantage of these new anti-pagan laws by destroying and plundering the temples. Theologians and prominent ecclesiastics soon followed. One such example is St. Ambrose, Bishop of Milan. When Gratian became Roman emperor in 375, Ambrose, who was one of his closest advisors, persuaded him to further suppress paganism. The emperor, On Ambrose's advice, the emperor caused the statue of Victory to be removed from the senate house at Rome (382). In this same year he abolished all the privileges of the pagan pontiffs and the grants for the support of pagan worship. Deprived of the assistance of the State, paganism rapidly lost influence. 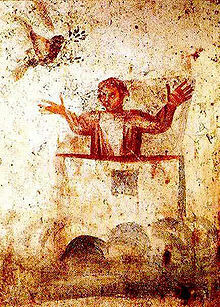 Depictions in the catacombs suggest that Christians readily adapted common motifs such as "The Good Shepherd", which in Roman culture represented "philanthropy", and the "orans" image, which indicated "piety". The transition from paganism to Christianity took place very gradually and unevenly in late antiquity and in the early Byzantine world. Customary funeral rituals remained. These included the belief that at the time of death angels and demons contest for the decedent's soul. Macarius of Egypt writes of such a contest, which is only resolved by the intervention of the person's guardian angel -roughly equivalent to Plato's daimon. A second belief was that the soul was weighed in the scales of justice; a concept that Eustathius of Thessalonica found in the Iliad. Both ideas precipitated loud lamentation, which Gregory of Nyssa and others attempted to modify to the singing of psalms and hymns. In 609 Pope Boniface IV obtained leave from the Byzantine Emperor Phocas to convert the Pantheon in Rome into a Christian church, a practice similar to that recommended eight year earlier by Pope Gregory I to Mellitus regarding Anglo-Saxon holy places, in order to ease the transition to Christianity. According to Willibald's Life of Saint Boniface, about 723, the missioner cut down the sacred Donar's Oak and used the lumber to build a church dedicated to St. Peter. Around 744, Saint Sturm established the monastery of Fulda on the ruins of a 6th-century Merovingian royal camp, destroyed 50 years earlier by the Saxons, at a ford on the Fulda River. Following Bede, it was for a long time thought that the name of the Christian holyday of Easter derived from the Anglo-saxon goddess "Eostre". 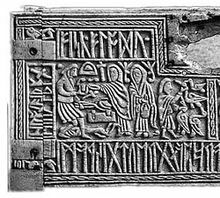 Later scholars considered it unlikely that Anglo-Saxon churchmen would name their holiest feastday for a pagan goddess, and that it was more probable that the name comes from the Anglo-Saxon eastan, meaning east. After his death, King Oswald of Northumbria came to be regarded as a saint, and the spot where he died was associated with miracles. Reginald of Durham mentions one, saying that Oswald's right arm was taken by a raven to an ash tree, which gave the tree ageless vigor; when the bird dropped the arm onto the ground, a spring emerged from the ground. Both the tree and the spring were, according to Reginald, subsequently associated with healing miracles. Aspects of the legend have been considered to have pagan overtones or influences and may represent a fusion of his status as a traditional Germanic warrior-king with Christianity. The cult surrounding him gained prominence in parts of continental Europe. The Germanic Pagan solstice celebrations (Midsummer festivals) are also sometimes referred to by Neopagans and others as Litha, stemming from Bede's De temporum ratione and the fire festival or Litha was a tradition for many pagans. This pagan holiday was basically brought in and given a name change, and in Christianity was then associated with the nativity of John the Baptist, which now is observed on the same day, June 24, in the Catholic, Orthodox and some Protestant churches. It is six months before Christmas because Luke 1:26 and Luke 1.36 imply that John the Baptist was born six months earlier than Jesus, although the Bible does not say at which time of the year this happened. As some argue, some of the most basic tenets of Christianity "derive from ancient paganism rather than from the Bible." Others put it more plainly, writing that many symbols that "modern-day Christians associate with Christmas have pagan roots." Martin Luther King, Jr. even wrote about this connection while in late 1949 or early 1950, noting that the place at Bethleham selected by early Christians as Jesus's birthplace was an early shrine of a pagan god, Adonis, with the story of resurrection also said to be similar to that of Adonis. His essay also argued that the descent of Jesus into hell was also borrowed from paganism, as was a baptismal ceremony. More recently, some scholars have argued that Easter symbols "give the festivities an air of pre-Christian paganism," but added that Easter rituals as they are now known represent "an untidy collection of customs" and that any "connection with pre-Christian paganism is entirely coincidental." Richard A. Fletcher suggests that Holy wells developed out of a like adaptation. Some time prior to 655, Œthelwald of Deira gave Chad of Mercia land upon which to build a monastery. According to Bede, Chad felt is necessary to fast for forty days in order to cleanse the place. This ritual purification indicates that the new monastery was likely built on the site of a pre-Christian cult. ^ "Notes & Commentaries". Retrieved 2019-04-22. ^ "BBC - History - Ancient History in depth: Christianity and the Roman Empire". www.bbc.co.uk. Retrieved 2019-04-22. ^ "Pagans and Christians". Ross Douthat. 2014-10-03. Retrieved 2019-04-22. ^ Bond, Sarah. "Why Did Early Christians And Pagans Fight Over New Year's Day?". Forbes. Retrieved 2019-04-22. ^ a b c "2. From paganism to Christianity". chs.harvard.edu. Retrieved 2019-04-22. ^ "The Collision With Paganism | From Jesus To Christ - The First Christians | FRONTLINE | PBS". www.pbs.org. Retrieved 2019-04-22. ^ a b c Frank Dunkle, David Cobb (2011-10-22). "Paganism In Christianity". United Church of God. Retrieved 2019-04-22. ^ Kuruvilla, Carol (2015-12-17). "What Christians And Pagans Have In Common During The Holidays". HuffPost. Retrieved 2019-04-22. ^ University, © Stanford; Stanford; California 94305 (2014-12-17). ""The Influence of the Mystery Religions on Christianity"". The Martin Luther King, Jr., Research and Education Institute. Retrieved 2019-04-22. ^ Stevenson, Jane. "Easter: eggs, hares, lamb and the return of warmth and sunshine – a Christian festival that feels pagan". The Conversation. Retrieved 2019-04-22. ^ Fletcher, Richard. The Barbarian Conversion : From Paganism to Christianity. New York: University of California, 1999.